14" x 14" square. 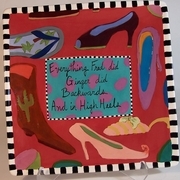 Saying reads "Everything Fred did, Ginger did backwards, and in high heels". Order by Nov. 9th to receive by Christmas. Dancing anyone! This platter reminisces the dancing grace of Fred Astaire and Ginger Rogers. Also the perfect gift for the shoe lover in your life!